Political leaders often rely, in their decision-making process, on public-opinion considerations, polls, and suchlike. But there are also those leaders -- especially leaders of political powers, or leaders who realize they stand at historical crossroads -- who take into consideration not only what their people will think about their actions, but also what future generations will. They care about how history will judge them. But “history” does not judge people. Historians do. And these, it turns out, are often not of a single mind. The historic perception of past leaders can change over time, and in this sense the ivory towers of historic research are somewhat like a stock exchange market; the going rate for a person “traded” in this market can rise or fall as new documents are found, when moral standards change, when later historic events shed new light on the effects of past events, and sometimes just due to fashion-trends. And of course, there’s the historian’s own political agenda. It may be significant that among the fifteen scholars and public personalities who participated [in a conference about Churchill that was held in January 2001 in the University of London] only one historian was severely critical of Churchill. (Another criticism was more balanced). Buy, gentlemen, buy: these stocks are going up. Lukacs admits that he “cannot really explain” (p. xi) why this is so, after the harsh criticism thrown at Churchill in the late 1980s and early 1990s, yet he tries to find explanations anyway. First, the historical perspective: how can we compare the towering image of Churchill to the midgets (“mediocrities”, in Lukacs’s words) that occupy the political stages of our days? Second, we can see today, after several decades, how precise Churchill’s political/historical predictions were. The book is comprised of nine chapters. The final one is a personal, sentimental account of Churchill’s funeral. 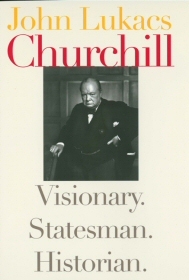 The other eight are in fact eight independent articles, some previously published, and they deal with three aspects of the man Churchill, as indicated by the book’s title: Churchill as a man of vision, Churchill as a statesman (in particular his relationships with Stalin, Roosevelt, and Eisenhower), and Churchill as a historian. Still, the book is not aimed at readers completely unfamiliar with Churchill’s story in general, and his actions during World War II in particular. If all you need is a refresher, the Wikipedia article will probably be enough. More complete references can be found in the book’s eighth chapter. [...] we, at least beyond the twentieth century and perhaps of the entire so-called Modern Age, ought to know that the ideal of Objectivity, meaning a complete, and antiseptic, separation of the observer from the matter observed, is impossible (and not only in the mental but also in the physical world); that the altnerative to Objectivity is not subjectivity (which is but another form of determinism); that all human knowledge is inevitably personal and participatory. As a historian, Lukacs cares about Churchill’s credibility as a historian. He therefore searches in every nook and cranny for all those cases where Churchill was “marvelously fair to evidences and arguments contrary to his” (p. 117). Lukacs extols Churchill’s civility (in Triumph and Tragedy, the sixth and final volume) towards the editors of Time and Life, which attacked his policy during the war, as well as his magnanimity in presenting the history of his relationships with Eisenhower -- a general in the time discussed, president of the United States when the history was published. But clearly, Churchill’s softening of the rough relationships he had with Eisenhower during the war was not due to magnanimity alone, considering that Churchill the historian was also prime minister when the volume was published. And how good is Lukacs himself as a historian? It seems like he himself is very far from objectivity: throughout the entire book, he sounds like a groupie of Churchill. The book includes numerous attacks on historians who dared criticize his idol. Most of these attacks sound reasonable, but it is hard to be convinced when the overall tone does not even pretend to be objective. In this respect, the chapter that deals with Churchill’s shortcomings, critics and even failures is especially interesting, but even here Lukacs seems unable to rise above his fandom point-of-view. In summary, I recommend the book only to those who have a positive view of Churchill to begin with; the book can have an undesired effect on the blood-pressure of others. Another possible target audience is history students who search for a research subject; the book includes several research ideas of interest.